Now that I’ve long ago moved out of my parents’ house and no longer take vacations with the whole family, I was pretty certain I had left the vacation bloopers behind me. Ah, but doesn’t life tend to surprise us? As I found out this Christmas, I still have a little bit of Griswold left in me: About half way through the four-hour drive to my parents’ house on Christmas morning I had a sudden thought that I wasn’t sure if I had remembered to put my overnight bag in the car when I was loading up the trunk. As it turns out, I had remembered to pack absolutely everything except for my bag. It was way too late to turn around at that point, so I spent our two-and-a-half day trip wearing my Christmas outfit and borrowing whatever else I needed from my mom and my sister-in-law. Oh, the fun never ends! 1. My suspicion that I’ve been putting too much effort into taking care of other people’s wants and needs at the expense of taking care of myself seems to be spot on. 2. I don’t need nearly as much “stuff” as I think I do. So it looks like my New Year’s Resolutions, which I never intended to make in the first place, have been determined for me. 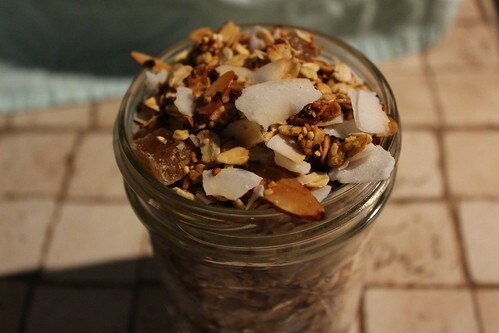 And in the spirit of these resolutions of simplicity and self-care, I offer you my favorite granola recipe. It’s easy to make, healthy, and includes a little treat in the form of crystallized ginger, which I think we all know is just candy in disguise. Wishing you all a very happy new year, full of friends, family, fun, and food….and hopefully with a minimum of Griswold-esque shenanigans. I love the surprise sweet and spicy bites that the crystallized ginger adds to this granola, but if you’re completely against any sort of candy in your breakfast cereal you can feel free to substitute dried fruit instead. Something tropical like pineapple, mango, or even banana would be delicious. Combine the oats, quinoa, almonds, and hemp hearts in a large bowl. Combine the coconut oil, honey, orange juice and salt in a small bowl or measuring cup. Stir well, then pour over the oat mixture. Stir well to combine. 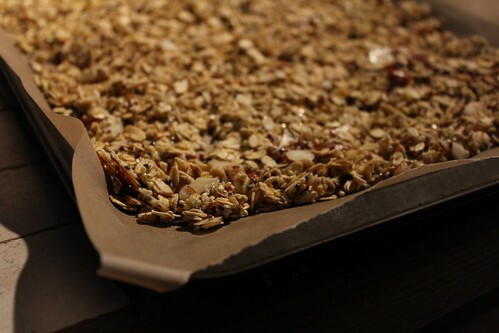 Pour the oat mixture onto the two prepared cookie sheets and spread out into a thin layer. Bake for 20 to 25 minutes, stirring every 10 minutes or so, until the granola just begins to take on some color. Add half of the coconut and ginger to each cookie sheet and bake for another 10 minutes or so. The granola should be a light, golden brown. Remove from the oven and allow to cool on the cookie sheets. 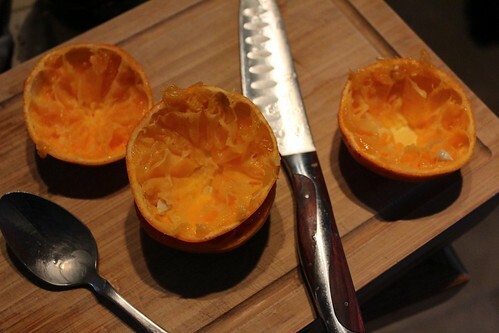 Once cooled, transfer to airtight containers and store at room temperature.